Are you looking to save your on engineered stone countertops cost in Maryland, Northern Virginia, Baltimore, Annapolis, Alexandria, Fairfax and the surrounding areas? At Express Countertops all we do is fabricate and install countertops, allowing us to streamline our overhead and pass the savings on to customers like you. Keep reading to learn all about the things you can do to save money on your home’s new counters. If you’d like to talk to a sales representative who can answer all of your questions, give us a call at 410-712-0601 and we’ll be happy to help. You can also click here to contact us through our request form for a fast, FREE estimate. When purchasing new counters for the kitchen or the bathroom, many homeowners think that there is a fixed, flat rate that they can expect to pay. The truth is that how much you can expect to pay for new countertops is affected by a wide variety of factors. Some factors can drive costs up while others can lower it. As the homeowner, it’s up to you to examine these factors closely, determine what’s important, and weigh your options against what you’re willing or able to spend. So, what are some of the things you need to look for when trying to figure out engineered stone countertops cost? The Measurements – Size is one of the most obvious factors in how much you can expect to pay for new countertops, so look at the area that you want to remodel very closely. You will want to ensure you get the area measured professionally so that you have an accurate depiction of how much it will cost to have your counters remodeled. Thickness – Countertops can be manufactured with different levels of thickness, and that means you could save money on your own installation by having counters that are on the thinner side of what you might typically find otherwise. Accessories – Countertops can come with custom edges that be made into a variety of different shapes, but those shapes can add to the overall cost if they’re elaborate. Consider simpler round edges to keep the costs of your countertop installation down. Shaping – If you want custom shapes, then that’s something you will need to consider as a huge factor for your engineered stone countertops cost. Because extra steps need to be taken for a countertop to reach that shape, you can expect the cost of the project to rise. These are just a few of the many factors that can influence the finale price on a countertop remodeling project, but they are some of the most important of which you need to be aware. In order to make sure you get the perfect counters for your home, you need to work with remodeling professionals who can take a look at your exact needs and help you make the choices that will best fit your lifestyle. When you want expert countertop installation for your home’s kitchen and bathrooms, you can trust the professionals of Express Countertops to deliver high quality fixtures! At Express Countertops, we can help you determine realistic engineered stone countertops cost from world class manufacturers like Zodiaq, Cambria, and Icestone, so you will get nothing but the best from your new counters. Our years of experience in remodeling kitchens and bathrooms means that nothing will be overlooked when designing your new counters. Get in touch with us soon and let us show you just how it’s possible for you to have the countertops you’ve always wanted. Getting started is easy. All you have to do is call 410-712-0601 or click here to contact us online. We’ll discuss engineered stone countertops cost per square foot and any factors that might influence the price of the project before we get started. 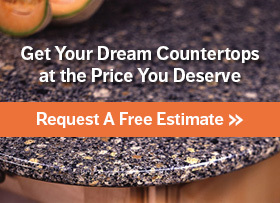 With our 7-day Installation Guarantee, you can have your new countertops in a week!